Upon noticing that an alto clef sideways, emoticon-like, fit nicely over a woman’s bust, we knew we’ve been working too much lately! But we decided to put it on shirts anyway, for violists who dare to be different! 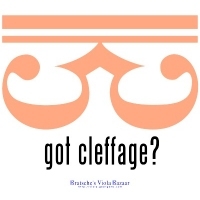 Kidding aside, this design would make a great gift for that special crazy and offbeat violist on your list! Buy this design now on any t-shirt or apparel item from Bratsche’s Viola Bazaar!